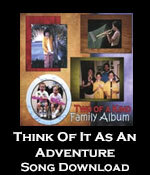 When things didn’t go quite as planned on a family vacation, David remembers his parents saying, “Just think of it as an adventure!” The various situations in this song come from Jenny & David’s experience, both as kids or parents. Maybe some of these things have happened to you, too! David had a lot of fun arranging this song for brass quintet for the recording.